Wine Tasting in Tuscany has been a decades long goal of Karen’s and mine so when we finally got to Tuscany, we knew we’d be spending some time in a winery. 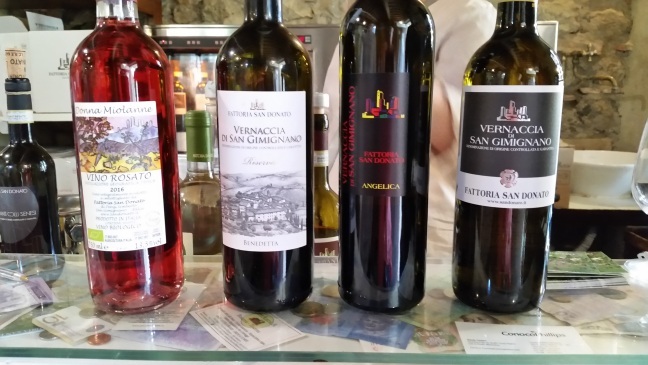 The interesting part however, is that in Tuscany, Chianti reigns supreme but in our little corner of heaven, San Gimignano, a curious wine grape called Vernaccia is the queen (it was explained to us that Vernaccia is a feminine grape..hence the “Queen”). Vernaccia is a white wine grape that only seems to produce good wines in the San Gimignano region. 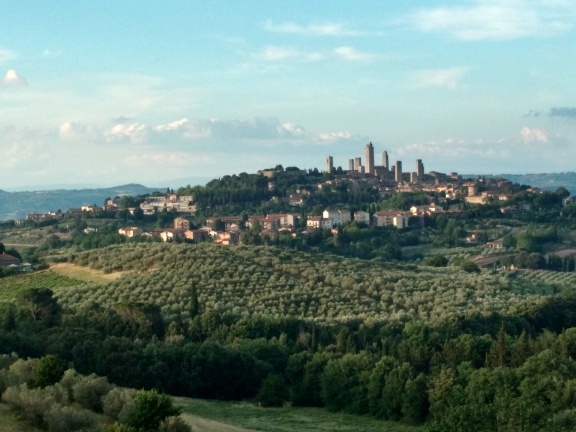 The borders of the growing region are quite well defined centering around San Gimignano, so Vernaccia de San Gimignano became the first DOC defined in Italy. A DOC, short for Denominazione di origine controllata is the Italian equivalent of a French Appellation or an American AVA (American Viticultural Area). The problem was where to taste, but in Italy, minor problems seem to solve themselves, and true to form, after eating at a great little Osteria in San Gimignano, we found a great house wine for an embarrassingly inexpensive price by California standards. The best part was the Winery was only 6 kilometers up the road and less they two kilometers from our hotel. We made an appointment to taste the following afternoon. 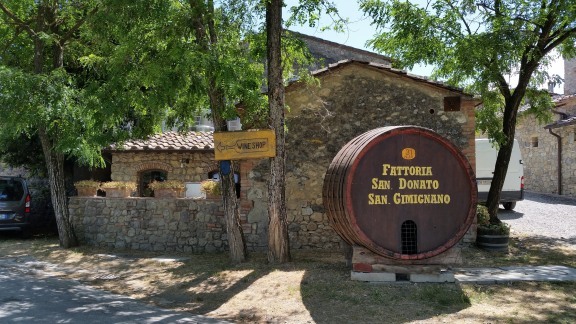 Fattoria San Donato is one of the newer breed of eco-tourism wineries where guests can stay, enjoy house prepared meals and partake in a number of other local wine and farming related activities. Although the ecotourism is new, don’t mistake this for a young, upstart winery. It has been in the Fenzi family for 85 years and it’s still going strong. Our hostess, Federica was with us for most of the tasting and then we took a tour with Andrea, the winemaker/vineyard manager/general jack of all trades. Andrea’s English wasn’t the best but between it, the few words we had picked up in Italian and similar sounding words in Spanish, we managed to have a great time in the vineyard and on the farm walk he took us on. The winery started using organic wine practices for years and since that time, the health of the vineyards has improved and the wine has improved along with it. 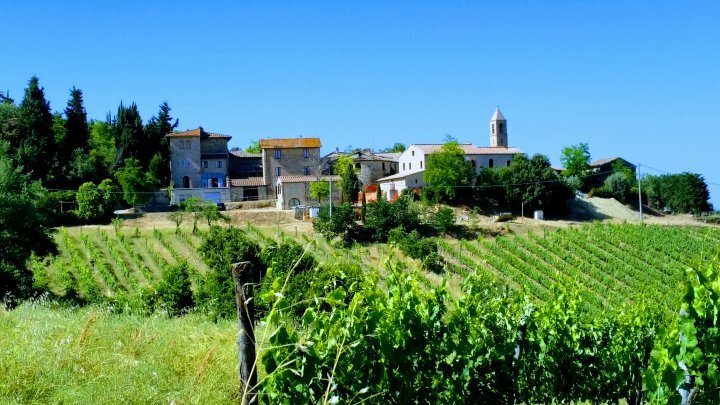 The Fenzi family feels that the organic practice encourages the vines to dig deeper for water and nitrogen and makes them less reliant on manmade chemicals which in turn, produces a stronger, healthier vine. Our first two tastings were Vernaccia of course, a 2015 batch called Angelica after one of the family’s daughters and a 2014 called Benedetta. They both had a longer palate than the other Vernaccia we had tasted, which makes them good food wines. They would be a natural pairing for shellfish but neither Karen nor I like shellfish so we would pair it with a lightly grilled chicken with a touch of lemon. The Vernaccia were good but we really like reds and in Tuscany, red wine usually means Chianti. The first one we tried was the 2015 Chianti Colli Senesi. It was aged in a steal tank and without the tannin added from a barrel, it had a surprisingly light, enjoyable body. This one was Danny’s favorite of the Chiantis. Next up, a 90%/10% blend of Sangiovese and Merlot, aged in oak for 18 months. It was called Fiamma, not surprisingly after another daughter (I think we are starting to sense a theme here). This was my favorite of the reds and was very balanced with a smooth finish and at 11euro per bottle, this was a real find. It would have been an even better find if we could have brought a couple of cases back home with us. The last Chianti was the Riserva called “Fede”. Our hostess’s name was Federica so I am going to go out on a limb and guess that it was named for her. It spent 2 years in mixed new and neutral oak barrels and was deeper in flavor but still very well balanced. It was also a really good value at 14 euro a bottle…yep…14 per bottle for a reserve wine. You won’t find that in California. I think I may try to permanently move into the winery when they are not looking. The last wine was a little unusual for Tuscany, a 2013 Syrah called Arrigo that spent two years in the barrel. Danny and Karen really liked this one. It was a tough choice to decide what to take home given our small bags and three week trip to Italy. We’re not as young as we used to be and we really didn’t want to carry around 20 lbs of wine to every hotel we stayed. In the end, we left with a Benedetto Vernaccia, and two of the Chiantis, the Colli Senesi 2015 which we gave to Danny to take to college and a Fiamma, and a slew of memories that will be with us forever. If you are in Tuscany…do yourself a favor and stay in or near San Gimignano and taste at Fattoria San Donato. You won’t be disappointed by the wine, the winery or the friendly family who owns and runs it. Our thanks to Federica for a wonderful time!